Does My Dog Need Probiotics? How Many Vaccinations Are Too Many? 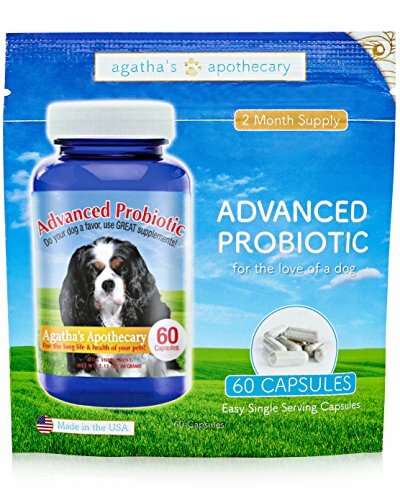 If you don’t buy any other product from Agatha’s Pet Wellness for your dog, please buy Advanced Probiotic. I’m passionate about this product because I know it works, it’s amazing and your dog will be healthier taking it. Expensive dog food alone isn’t enough to keep your dog healthy. I know some dogs will make it without support, but pets have a 50-50 chance of getting cancer and if something as simple as giving them a daily dose of healthy living probiotics can help beat those terrible odds, what great news! Turn back the clock for your much-loved pet and help her begin building a healthier immune system with a single daily capsule of our best dog probiotic. Probiotics are the most important supplement for your pet. Advanced Probiotic Capsules This is our flagship product, the one I first researched and used for Agatha and for all of my dogs. It is the best probiotic you can buy and I’ve researched them all, if there was a better one out there believe me my dogs would be taking it. The most important step you can take to help your dog fight disease is giving her probiotics. Research shows that just taking a daily probiotic can help prevent cancer and many other diseases. That alone is reason to begin using probiotics as soon as possible to protect your pet. "2 Billion CFU's per serving???" 20 Billion per Package??" "5 Strains of Good Bacteria!?" PLEASE READ THE LABELS PET PARENTS! Advanced Probiotic has 15 Billion CFU's and 10 Strains per serving! Probiotic Dog Essentials has an incredible 45 BILLION per SCOOP! (it was so hard not to use all CAPS! I read them and I'm shocked at the miserable ingredients in many dog probiotics on the market today! You're a smart pet parent. Do your homework, read the labels. Most probiotics for dogs are dismally low in both numbers of strains AND CFU's (the key to a really useful product). OR buy our product and save yourself time and energy, I designed it to be the best probiotic for dogs on the market and 1000's of pet owners orders prove it's performance. "Do my dog probiotics need to be refrigerated?" Until the bottle is opened, probiotics are surprisingly shelf stable, our's are kept refrigerated and chilled during packing, then kept in climate controlled storage. Studies show probiotics are stable up to 120 degrees, we keep ours at room temperature after they leave packing. Once opened, keeping your probiotics cool or refrigerated will help them stay fresher. (Probiotics do lose strength over time, that’s why we grow ours in small batches and pack them fresh to ensure the longest possible shelf-life). Our probiotics come in two delivery systems. Advanced Probiotic is a capsule formula. There are very good reasons to use capsules, though we offer a loose powder probiotic as well. Which of your probiotics is best for my dog (or cat)??? My favorite? Advanced Probiotic. The CFU's are lower than Probiotic Dog Essentials but it's the long-term daily benefit that builds those numbers in your pet's digestive system. I love the capsule form, here's why. Remember, probiotics are delicate and easy contaminated (and killed). Capsules are great because they protect delicate probiotics and offer owners a pre-measured, easy to use product. Capsules are easy to pull open and sprinkle the naturally sweet probiotic powder over your pet's kibble once daily. Again, if your budget is super tight or yours is multiple pet family? Probiotic Dog Essentials is a powerhouse product and if you have several pets it might make more sense. It's a blend of other immune building ingredients and if you remember to keep dirty fingers or spoons out of the package, you will appreciate the added immune support. Chronic ear problems resulting from food allergies. Toxic stress from exposure to pesticides. Exciting research in human studies (often available years before pet studies are begun) done on probiotic use, show that taking probiotics can help lower cholesterol, prevent dental disease and even prevent cancer. Holistic veterinarians are enthusiastic about high dose probiotic supplements for dogs and cat and the conventional veterinary community is quickly coming on board, daily probiotics for pets are an important way to help them stay healthy. Prebiotic Inulin 100 mg. (prebiotic which provides a mild sweet taste pets love). *Guaranteed living bacteria at the time of packaging.